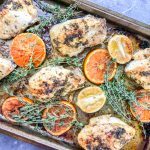 Citrus Herb Chicken Recipe is flavored with a blend of fresh sage, rosemary, and thyme combined with the juice and zest of perfectly ripe cara cara oranges. This one pan dish is perfect for your next weeknight dinner. In a small bowl, add fresh herbs, ghee, and avocado oil and stir until well combined. Set aside. Wash and pat dry chicken breast with paper towel. If chicken breasts are large, cut in half (I did). Season back side of chicken breast with dry seasoning. Flip over and drizzle marinade generously over chicken breast and season with dry seasoning. Place orange slices and limes into single layer on baking sheet. Place baking sheet in oven and bake until internal temperature reaches 165 degrees. Note: During baking, use pan juices to baste chicken throughout cooking time. Bake until internal temperature of chicken breast reaches 165 degrees to PREVENT CHICKEN FROM DRYING OUT. Although I used chicken breast for this recipe, you can use any parts of the chicken, and the recipe will turn out just as delicious. I used cara cara oranges but any type of orange will work just as well.